Two similar candlesticks or candlestick patterns on a trading chart often have the exact opposite interpretation, depending on where they fall in a series. You have to memorize the exact patterns to avoid getting confused. 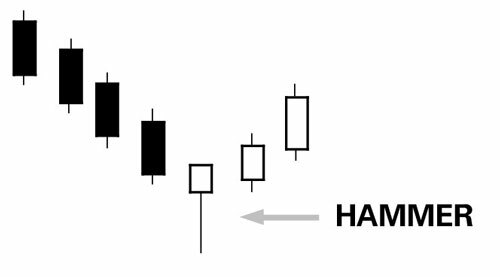 These two candlestick patterns illustrate how tricky some candlestick interpretation can get. Hammer: The long shadow extends to the downside off a white body. You may see a hammer in many other contexts, but when it has a white body and comes after a series of black downtrending bars, it implies a reversal. Note that the close is higher than the previous close, too. In this context, the long lower shadow means the sellers were able to achieve a new low, but buyers emerged at some point during the day and the close was higher than the open, indicating last-minute buying. Hanging man: The long shadow extends to the downside off a body that is either black or white. The hanging man usually has a black body coming after a series of white uptrending bars. The long lower shadow marks the bulls’ failure to prevent the bears making a new low and also from keeping the close below the open. You may see this bar in other places within a series of bars, but when you see it at the top of an uptrending series, consider that the trend is probably over. The wise course is to take your profit and run. A small real-body candlestick that comes after a bigger one is called a harami, which means “pregnant” in Japanese. A harami implies that a change in sentiment is impending. Technically, the harami pattern requires two bars, so it doesn’t stand alone. 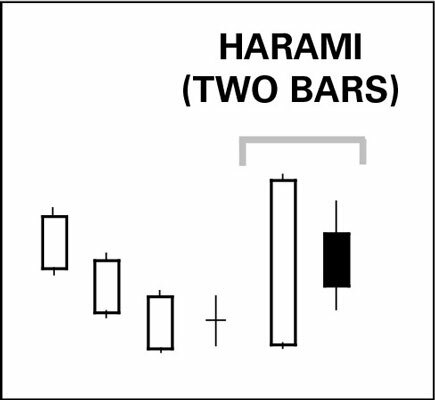 This chart shows the shadows of the harami bar as also inside the scope of the first big bar, although this isn’t essential to identifying the pattern. A harami can be white or black, and in fact, it can even be a doji (which has no real body or only a very small one). The smaller the real body, the more powerful the implication that a reversal is impending. The size of the bar is important. Both the exceptionally small harami and the exceptionally big bar preceding it express extreme emotion. The big bar means a bullish “let’s-buy” emotion. Seeing just the big white bar after a series of smaller ones that are downtrending, you may think that the bulls finally got the upper hand, and this movement is the start of an uptrend — especially because you have an indecision doji just ahead of it. But then the small black harami following the big white bar should disillusion you. If an uptrend was forming, the harami just put the kibosh on it.